This was one of two brands of cars massed produced in East Germany. 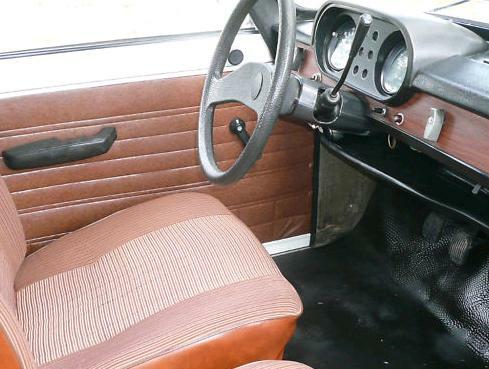 This was East Germany's "luxury" car. 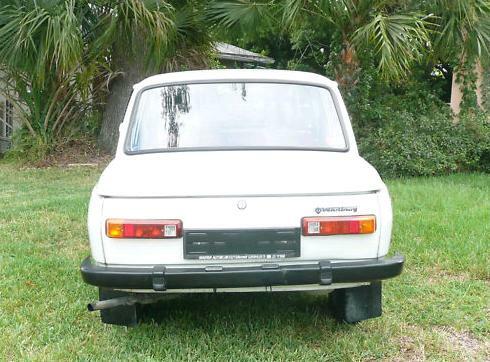 Before you laugh, just remember that the other East German car was the Trabant. This is looking pretty luxurious now, huh? These weren't really bad cars at all. 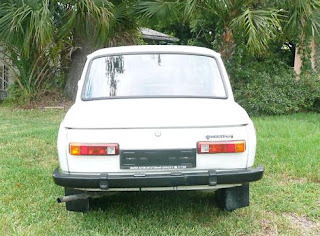 (And were damn good cars, when compared to the Trabi!) The engine was a simple 3 cylinder, 2 stroke unit. It has just seven moving parts (three pistons, three connecting rods and one crankshaft). Given the proper mixture of gasoline and oil, they'd run forever. The transmission is a synchromesh 4 speed with a column mounted shifter. These cars are FWD and have some pretty unique handling characteristics. They supposedly understeer like crazy on dry pavement and, as one website put it, have "a disarming disinclination to make turns in the wet". The body is steel and sits on a frame. It's not great looking, but it's not awful, either. 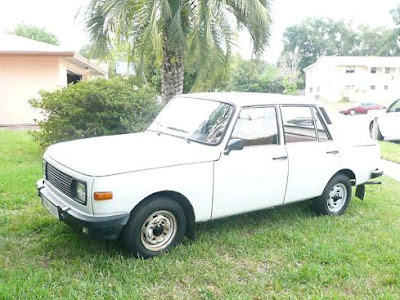 It looks like a typical 60's / 70s small, boxy European sedan. With a set of period correct aftermarket wheels, it would look pretty good. Wartburgs (different models than this one) were officially sold in the US from around 1958 until 1963. You can read about them on a site called Wartburg Cars in USA. There are some great pictures and info. Don't miss the "Wartburg And Skoda Hate Mail 1960" page. The red 353 that you posted a year or so ago is living in San Antonio. Neat car, I saw it when I bought a 190E 2.6 from the owner. Awesome, that town in Florida is only about a 45 minute drive from where I live. I haven't seen it on the road, but since that Dodge Rampage got posted on the site a few weeks ago, I actually saw someone driving it on the highway. As the car was being sold in the town I live in (and the city isn't that large) I guess I was going to see it eventually, but it was a pleasant surprise to see a car listed on here out in the wild. I'm so glad this car isn't conveniently located in the Northwest, it would sure look good parked next to my Lada. I would be All Over it!! !